You've heard about "flipping your classroom"—now find out how to do it! Introducing a new way to think about higher education, learning, and technology that prioritizes the benefits of the human dimension. José Bowen recognizes that technology is profoundly changing education and that if students are going to continue to pay enormous sums for campus classes, colleges will need to provide more than what can be found online and maximize "naked" face-to-face contact with faculty. Here, he illustrates how technology is most powerfully used outside the classroom, and, when used effectively, how it can ensure that students arrive to class more prepared for meaningful interaction with faculty. Bowen offers practical advice for faculty and administrators on how to engage students with new technology while restructuring classes into more active learning environments. José Antonio Bowen is dean of the Meadows School of the Arts, Algur H. Meadows Chair, and professor of music at Southern Methodist University in Dallas, Texas. "It's true that Bowen is interested in creating classroom space for interaction, discussion, reflection and engagement. But the book—part persuasion, part how-to—spends a great deal more time on what technology offers for the design of educational experiences.... 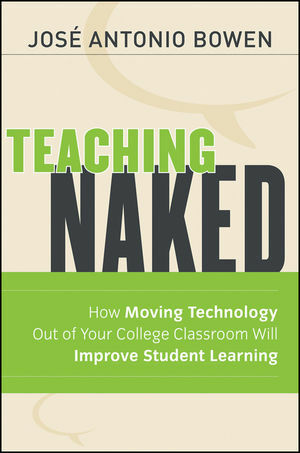 Teaching Naked [is a] good introduction to some of the most notable and/or promising types of resources for higher education." TeachingNaked.com : Visit José Antonio Bowen's website to learn more about his ongoing work.